To understand Quality, Environment Occupational Health and Safety Management System awareness as well as internal audit as per ISO 9001:2015, ISO 14001:2015 and ISO 45001:2018 standards requirements, Global Certification Consultancy has introduced IMS Awareness & Internal Auditor Training Presentation Kit. Integrating the three systems (QMS, EMS and OH&SMS) into one and sharing the common clauses and procedures often gives more efficiency. Considering this, we have created our training presentation kit to simplify the implementation of the integrated system in an organization. By implementing Integrated Management System (IMS), the performance of the employees can be improved which helps in reducing cost of production and maintaining quality of products. Our IMS certification consultancy and IMS awareness and auditor training kit is beneficial for companies that want to implement the IMS and get certification as per ISO 9001:2015, ISO 14001:2015 and ISO 45001:2018 from international certifying bodies. Integrated Management System (IMS) Awareness & Auditor Training Presentation Kit is prepared by a team of highly qualified management professionals and experienced consultants having rich experience of implementation of QMS, EMS and OH&SMS, internal audit and certification as per ISO 9001:2015, ISO 14001:2015 and ISO 45001:2018 requirements. This training presentation slides are extremely useful while conducting corporate training on integrated management system auditing within the organization or any work area. We have used it to conduct awareness training programs on IMS for our clients and helped them in successful implementation of integrated management system within their organizations. Our PowerPoint slides are in editable format. 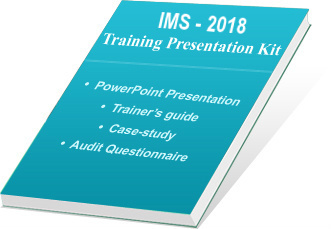 IMS Awareness and Auditor Training Presentation Kit contains more than 510 slides of ppt presentation and handouts of literature for participants. These handouts aid further learning and understanding of participants. Our IMS training kit is written in easy-to-understand language. The soft copy of presentation and hand-outs are given in editable formats. One can edit them as per their own requirements. Handouts are written in MS Word 2007 and Presentation Slides are prepared in PowerPoint 2007. Because of completely editable presentation, the kit is time-saving and cost-saving to create a new presentation for own use. Many companies are implementing IMS and getting benefits of ISO 9001, ISO 14001, ISO 45001 integration certification as an improved IMS in day-to-day life. In the preparation of training kits, the content has been verified and evaluated at various levels of our team. More than 1000 hours are spent in the preparation of this training presentation kit. Our training kit is prepared by the globally proven team of leading consultant.